Lady Mingella Beatrice Quimm (known to her friends as 'Creamy' Beatrix). The Sherwood Huckall and lkeston Team played several games of Congo when it came out. As part of the games we used this model as an objective and for obscure reasons we christened her 'Creamy' Beatrix (those obscure reasons mainly being that we are all about twelve years old emotionally). General B was so amused by the whole thing that he generously provided Steve and I with our own models of the lady in question. And I've finally got round to painting her. I think she may be from Black Cat Bases - judging by her face and size she's from their "Went Ten Rounds With Evander Holyfield" range. She's certainly, erm, "sturdy". Indeed at one point I wondered if she was supposed to represent someone in drag (as an escape ruse) but her "embonpoint" suggests otherwise. Anyway, a fun model to paint. We used her for games of Congo but I think her dress suggests a late Georgian or earlier Victorian period (not that I'm an expert), so I've based her to match my Napoleonics rather than Darkest African collection. Several months on, General B and I got back together to get our CoC's out and continue our campaign. In the last game my advance had been rudely thrown back by the Germans, and so, seizing the day, General Ballzimmer has ordered the Heer on to the counter attack. My force was really rather battered after the last game - in the end I amalgamated my remaining men into just two squads at almost full strength, rather than take three bashed up ones. The Germans have only lost a couple of men! We played the Probe scenario - so all the Germans had to do was get a team off my table edge. I hadn't read this in the scenario, so rather foolishly didn't have my JOP's opposite the shortest route from the German ones. Fortunately General B has been making barbed wire - so I chucked a load of that in the way. Sadly the German support roll was high enough the they'd have a StuG along for the ride. Realising I had little that could harm the assault gun, and that all he had to do was drive it off my table edge to win - the German commander gunned the engines and raced up the road. However, lucky rolling meant I had a Cain of Command dice! Ambush! Rather predictably, instead of launching a missile right up Fritz's exhaust pipe my brave team missed. Desperately I bought some more men on, then forgot to put them on tactical and so the MG42 took a couple down. The bazooka team desperately stalked the tank, hoping for anther shot, but sadly a three was rolled and Klaus Der Tanker rolled the StuG off the board and claimed the victory. This was a fun but quite short game. All over in a few phases -.prolonged only by the fact we'd not played for several months so had to look everything up. However, despite it being short and there being not much in the way of actual fighting it as great to play. The campaign really makes you think about how to use your men - not just throw them on and hope for the best as you'll probably need them alive for the next game! I've now called for reinforcements. Which will get me back to almost three full squads (though I may deploy one without BAR. The column has pushed ever deeper into the mountains of the Ilkestaan region of the North West Frontier. Much of the journey has been uneventful, two days ago a scouting company briefly joined the column but has now departed with no enemy sighted. Fort Ookinall is now but a day's march away. Nothing has been heard from the garrison so it is imperative the column pushes on. However soon after breaking camp movement in the hills is spotted and the column is forced to deploy to fight. The mountain gun is rapidly assembled and prepares to offer covering fire. Suddenly the second company is assailed by a hitherto unseen enemy. And the Dilshad Rifles spot enemy in the distance. The Dilshads and the 1st Co. have pushed up but the 2nd Co. are under pressure. And thunder in to the 1st Co. The 2nd Co. having seen off the enemy riflemen are faced with sword armed tribesmen. "Hold steady until I give the word, lads!" However the tribesmen fell on them before the word could be given. Fortunately stout British hearts and strong Sheffield steel saw the Pathans off with minimal casualties. From this point the British resorted to their superior firepower to see off the piecemeal attacks of thee Pathans and Al-Bhabij soon slunk off to fight another day. A fun little fight, but one where my dice favoured the British and so it turned into something of turkey shoot. The few times the Afghans made it into combat saw fortunate British roles see them off. Now, onwards to relive the fort! 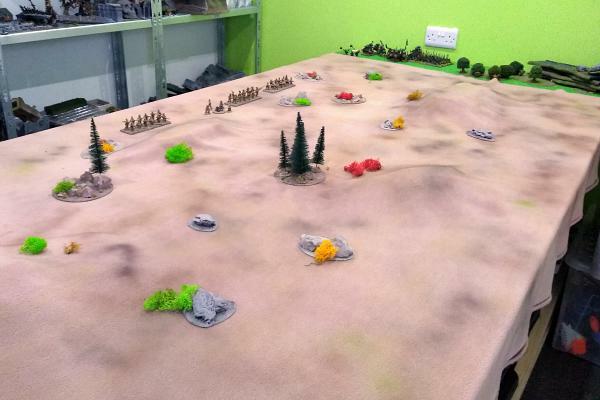 As General Ballroom is not implacably opposed to WotR in the way he has retroactively convinced himself he is to Warhammer there's a chance we might be able to play this as part of the Sherwood Hucknall Ilkeston team. I actually have quite a large force of Easterlings that I painted when the game came out. And so inspired by talk of a game I went looking for some part finished models I could polish off and ta-dah! eight Khand are now ready to wage war. They had been undercoated and some highlights brushed on but all the red armour and the flesh is newly done. Bish, bash, bosh. Stephen and I got together for a cheeky Saturday afternoon game of Warhammer 8th edition (greatest of all the games). I fettled a scenario from One Hour Wargames, based loosely on Wavre. The attackers have to get one third of their army off via the road and hold the gatehouse over the river, meanwhile the defenders must remove a sixth of their army via the same route at the end of each of turns two, four and six of the seven turn game. We set up then diced to see who would attack -turned out to be me and my Slaanesh Daemons. I'm still struggling with my camera in the North Notts Palais des Jeux - despite Stephen investing in higher quality illumination. I suspect it's more to do with me not knowing how best to use a camera. The daemons splashed across the river - which turned out to be potentially nasty, but good rolls and then some daemonic saves meant casualties were light. Meanwhile the undead knights headed off the board without taking part as the Vampiric withdrawal began. After a little to-ing and fro-ing the big batty things charged the Keeper of Secrets. And the vampire himself decided to have a go at the Daemonettes. Which he proved rather good at. The Keeper dealt with the flappy things, but then got some Zombies all up inside his grill. The fiends charged more dead stuff, desperate to get off the board. Not sure what the diff is between these pics. The Vamp Lord joined in to take out the Keeper. Inevitably the Daemon lord succumbed to the Vampire. However only a third of the Undead forces had made it off by the end of turn six. Unfortunately I had insufficient troops to claim the town and exit the table. So we called it a draw. Good fun game and the scenario worked to make things interesting. The one thing I wasn't happy about when playing my solo TMWWBK game last week was the gaming mat. I'm sure some parts of the NWF are indeed a verdant green, but the terrain of my minds eye is rather more rocky, deserty, arid and, well, altogether browner than that. So I pottered off to Boyes in search of a suitable cloth and purchased 2m of some "Camel" coloured fleece. It comes 150cm wide, so around 5ft which means it'll fit across my 4ft table and allow me to place hills and the like underneath. The 2m length is more than enough for TMWWBK games which need 6ft. 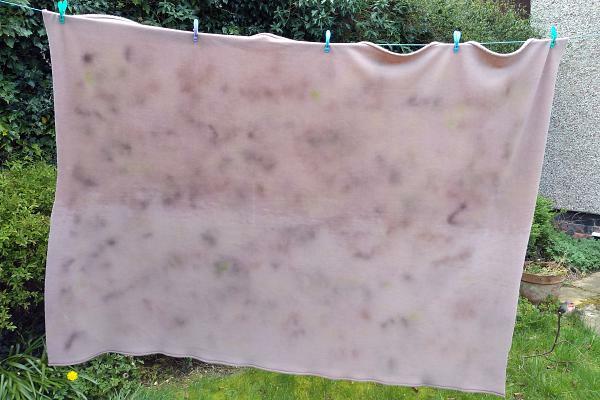 In order to break up the uniform nature of the cloth I hung it on the washing line, grabbed an assortment of rattle cans and sprayed some random browns, greens and deserty yellows. I'm very pleased with the result - looks much more like the rugged foothills of Ilkestaan than previously. The cloth cost £13 and the cans I already had, so a bargain in my book. General B. was once again unavailable for Wednesday night soldiering so I made the short trip northwards to the North Nottingham Palais des Jeux to game with Steve. Inevitably our chosen system was Warhammer 8th edition, greatest of all the games. I took Ogres and Steve pulled out his Aston Villa themed Slaanesh Chaos force. We played the meteorite scenario. where you get a point each turn for each meteorite you control. Sadly the NNPdJ isn't as well illuminated at the Sherwood Soldier Shack, so the pictures came out a little dark and then post production attempts to improve them have left them a little weird looking. The Leadbelchers hid behind a privet hedge. Hur, hur! The Ogres formed a wall of grey flesh. The Villa-ns of the piece. Odd that the Dragon Ogres have blue faces - surely a BCFC thing? Trolls! Fortunately I have something burny for them to deal with. The Ogres mostly rumbled forward. And crashed into the Trolls, waving their burny flag. The Giant decided to have a pop at the Dragon Ogres. Over on the right the 'belchers were in a spot of bother. The warriors went to help the Dragon Ogres - who actually seemed to be doing OK.
As a result of their intervention the giant fell over. On top of the warriors. Steve and I both rushed for our clear plastic fallen Giant templates. Probably the first time they've ever been used. Six (appropriately for Slaanesh) warriors were crushed. The Big Lads decided to deal with the Dragon Ogres. The Butcher and his boys went after the Marauders. Who proved a bit spiky. At this point I forgot to take any more pictures. And not just because I began to lose quite heavily. The Lord of Slaaanesh on his Boobworm killed the BSB's unit and then came back around to help the warriors sort out the Ogre Lord and his bodyguard. The Ogres killed him, but lost the fight. The giant Chaos beasty and the remaining troll drove off the butcher and the late arriving Gorger wasn't able to secure enough VPs to pull bacjk the game for me. Good fun and over quite quickly (two charge-y armies not much magic or shooting).